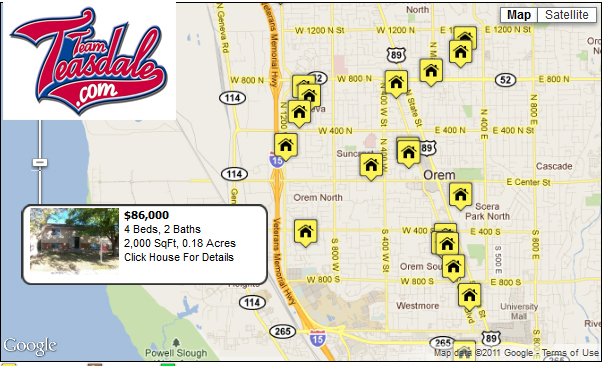 There are 338 different properties for sale in Orem, Utah. Most of these properties are residential, single family homes, but there are a few luxury condos or townhomes in Orem. Prices of Orem Real Estate have gone down over the last four years. Prices range from a low of $85,000 to $695,000. In 2013 houses that sold had a median sold price of $195,000. In the 3rd quarter of 2013 the average single family home that sold in Orem was $204,226. Other real estate on the market in Orem includes 46 condos, 8 multi-unit buildings including duplexes, triplex, and fourplexes and other multi-family properties for sale. Request a daily list of Orem Utah homes for sale: List of Orem Utah Homes for Sale. If you have questions about buying or selling a home in Orem Utah contact a group of Utah County Realtors. If you need help Selling a home in Orem Utah let Team Teasdale Realty give you a free comparative market analysis (CMA). There are new and old homes alike in Orem. Many of the major neighborhoods and developments have names like Geneva Heights, Mountain View, Westlake, Cherry Lane, Linclon Gardens, Fairlawn Park, Parkwood Estates, Birchwood, Beverly Place, Country Estates, Vale Manor, Timpview Village, Rolling Hills, Beverly Place, Heatheridge, Country Estates, Durfey Acres, Green Thumb Area, Christeele Acres, Rose Park, Westwood Acres, Sage Crest, Glendell, Elmont, Rieske Subdivision, Kingslynn, Edge View, Ruthetta Gardens, Sunset Vista, Ribbonwood, Century Estates, Sunray Park, Westlake, Paul Rawlings, Rocky Manor, Executive Estates, Cliffs, Heritage Homes, Cherapple, Willowsprings Estates, Chelsea, Silverleaf Estates, Cove Estates, Providence, Bretton Woods, Windsor Court, Fairway Estates, Old Orchard, The Berkshires. Orem Condos for Sale - Orem has a few luxury condos for sale. They are found in Amiron, Canniery Cove, Kingston, Willow Tree, Garden Park, Orchard Creek, Weston Condos, Stonebrook, Countryside Square, Granite Village, Shadow Ridge, Park Avenue, Oak Crest, North Point, Lake Ridge, Chase Lane, East Abby, Lakecrest, Tanglewood Estates, Eastview Condo, Condos offer several advantages over single family homes. Namely, they are substantially less expensive per square foot, and they include very little land. Home Owners Insurance on condos is also cheaper than single family homes as the exterior of condos is usually covered by the monthly home owners association (HOA) fee. View Orem Utah Condos for Sale. It is definitely a buyers market in Orem. For the first half of 2011, 337 residential properties listed on the MLS were sold. The average MLS listing has been on the market for a hundred days. Home prices may drop a little more as there are many motivated sellers, short sales and bank foreclosures in Orem. The bottom is difficult to predict. Large real estate discounts can especially be found on the high end, land, and spec homes as many properties are entering default and are in danger of foreclosure and or short sale. The majority of Orem homes for sale are sold by Realtors and are listed on the MLS. Would you like to search bank foreclosures and short sales only in Orem? 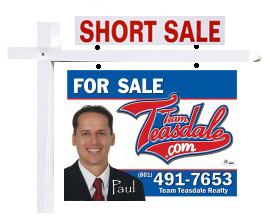 The links below provide lists of only Short Sales and Bank Foreclosures in the Orem area. See Our Orem Utah Blog: Buy Orem Homes.